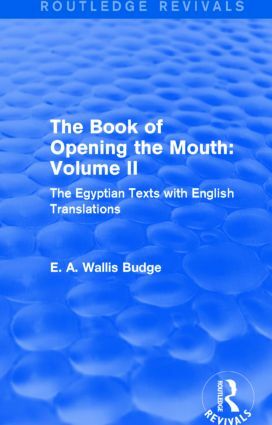 The recital of The Book of Opening the Mouth and the Liturgy of Funerary Offerings were in use among the Predynastic Egyptians of the later part of the Neolithic Period, before the art of writing had evolved, and continued to exercise a considerable influence on Egyptian religious literature up until the time of Roman Empire. The ceremonies were believed to enable the spiritual elements of the deceased to continue their existence. The object of the formulae was the reconstitution of the body and the restoration to it of the heart-soul (‘Ba’). This is the second volume of The Book of Opening the Mouth, first published in 1909, which is edited from three copies written in the nineteenth, twentieth and twenty-sixth Dynasties respectively. It is believed they describe faithfully the forms of the rites which originated among the primitive indigenous inhabitants of the Nile Valley.